Please know that appealing punishments no longer than 10 days will result in an automatic denial. Appealing a 2 hour ban results in no taken action. You are allowed to create an appeal for a friend, but only one appeal. This is under extreme circumstances only, like in cases where the banned player can't make a forum account to appeal with. What is your Username/IGN that has been Punished by our Staff Members? when you are try to log into Centrix. There should be 3 options for you to choose from, you only need to choose one. The difference between a IPBan and Ban is that when you get IPBanned, all accounts linked to the IP will not be accessible, whilst a ban only applies to a specific account and not any other accounts that are linked to the IP. There should be 2 options for you to choose from, you only need to choose one. Whether it was a tempban or mute, it is still considered a punishment and you should know If you have been punished by one of our Staff Members before. This is important as you have to explain yourself why you have abused or violated our rules and got punished by one of our Staff Members. Giving a good explanation will show maturity, knowing what you have did wrong or right in that situation. Here, you can give us any sort of information you like that would help you in getting your appeal accepted or considered. Never tag a Staff Member in your Appeal! Tagging a Staff Member in your appeal will not help in having your appeal dealt with faster, it might also result in a instant denial of your appeal. Once you have created an appeal, It will be replied within 48 hours, so be patient! Never blame anyone for getting you banned! Whether it was a dare with your friends to violate or abuse our server rules, or you are just trying to get your Punishment Removed, you have been banned for a reason and you should just stick to admitting your mistakes and being honest! Never message a Staff Member to check your Appeal! The Staff will check your appeal when they are free and when it is appropriate. Messaging a Staff Member to check your appeal will only result in you being ignored in the message or your appeal being denied. We understand that you are anxious in getting your punishment removed or answered, however, Creating multiple appeals will increase the chances of your original appeal being denied. If your appeal hasn’t been replied after 48 hours, you can bump your appeal. Be truthful in your Appeal! Lying in your appeal will NOT help in your appeal as it only shows how much you want in getting your punishment taken away. Being truthful will instantly show the Staff Team how much you want to have your punishment taken away and your decency. Make sure your appeal has no language or vocabulary errors! If your main language is not English, you can speak in other languages and we will have the appropriate staff to check your appeal. Making multiple language errors or having many abbreviations and making it not understandable will not help us and it might cause your appeal to be denied. Never make excuses or stories in your Appeal! The Staff Team will NOT entertain your excuses or stories of you in the server and why you were punished. Just be honest with your appeal and have a good reason why we should take away your punishment. Before reporting a player for apparent abuse/violation of our Official Centrix-Network Rules, You must first briefly understand our Official Centrix-Network Rules and use common sense on differentiating what is wrong and what is right. You will also need to provide evidence regardless of the severity of the offence or if you have any witnesses that saw the apparent abuser/violator. If there are no evidence/proof provided in your report, It will be instantly denied! Format For Creating A Report! 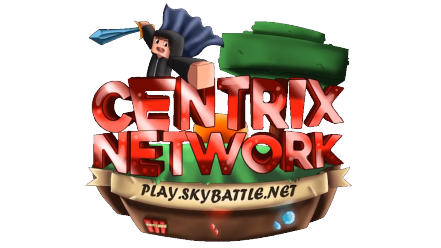 What is your Username/IGN that you play with on Centrix-Network? Who were the apparent abusers/violators? Please state their In-Game Names. What happened on the server that led you to report them? Were they hacking? Scamming? Please make a clear and detailed statement on what happened so we can better understand. When did the incident take place? Please state your own time and date that the incident happened and provide your timezone. Do you have a screenshot/video of the abuser/violator? Please provide a clear screenshot, If your video is more than 30 seconds, please provide the time in the video where it clearly shows the player abusing/violating our Official Centrix-Network Rules. What other sources of Information would you like us to have so to better understand the situation or why the player is abusing/violating? Never tag a Staff Member in your Report! Tagging a Staff Member in your report will not help in having your report dealt with faster, it might also result in a instant denial of your report. Once you have created a report, It will be replied within 48 hours, so be patient! Never message a Staff Member to check your Report! The Staff will check your report when they are free and when it is appropriate. Messaging a Staff Member to check your report will only result in you being ignored in the message or your report being denied. We understand that you are anxious in getting the abuser/violator punished. However, Creating multiple reports will increase the chances of your original report being denied. If your report hasn’t been replied after 48 hours, you can bump your report. Be truthful in your Reports! Lying or accusing players in your appeal will NOT help in your report as it only shows how trustworthy you are in other reports you will be making in the future. You might also be punished on the forums/In-Game for purposefully intending to have a player punished without sufficient proof or even accusing a player for apparent abuse/violation of our Official Centrix-Network Rules. Doing so will also lead to an Instant Denial of your current report and even future reports you make. If your main language is not English, you can speak in other languages and we will have the appropriate staff to check your report. Making multiple language errors or having many abbreviations and making it not understandable will not help us and it might cause your report to be denied. I hope all these information have been enough to boost your knowledge on how to create a proper report in the event you have found a abuser/violator in any of our Centrix-Network servers. However, you should always follow the Official Centrix-Network Rules and not get in trouble! If you have any further questions, please message me and I will be happy to answer them. As a Jr Helper, your main role is to watch chat and answer player's questions. In this period, you will be in trial to become a Helper in CentrixPvP. You need to be at least 14 years old! Decent knowledge of the English language. Must be active on forums & in game. You need to be playing for at least since 2 months. Be online for at least one hour a day. You cannot be staff on other servers. As a CentrixPvP Developer, you will have to choose between Web Development or Java Development. Right now, we mostly need Java Developers! Requires basic knowledge of IntelliJ IDEA. Requires at least 10 hours of coding a week. A decent computer is a must-have (minimum: 4 GB RAM, i3). Basic knowledge of Git & Maven. If you got accepted than you will have to start as a trialist in our build-team. This means that you have to build something by yourself. No help is allowed! Cheating to get a builder rank is impossible with this rule. You will get more info when you got accepted. You will also have to follow the rules like every other person on the server! You don't get OP on any server except for the buildserver. Copying builds from anywhere will lead to a denial and you won't be allowed to apply anymore! Not providing any screenshots or videos or creative homes will also lead to an instant denial! What to do if we built the map in a team? You will have to say what you did and who helped you. It could be that you will get accepted and the other person not so try to build solo! How regularly are you planing to upload/stream on are Network? If you get accepted you will receive the YouTube rank. You will also have to provided us with proof that the channel is yours. - Dedication and professionalism when the occasion calls for it.